Laura M. Labovich, President and Founder of Aspire! Empower! Career Strategy Group, a DC-based career firm, advises college students to anticipate opportunities to ramp up their job search, even during a semester break. So, how can students use spring break to inch closer to future employment? Vacation to a Target Geographic Region. Instead of taking a 3-day cruise, take a road trip to discover if a city is a “fit” with your values, personality and interests. An effective job search includes a narrow geographic target, so filing a city in the “no” column is equally important as putting it in the “yes” one. Connect With Employers. Prior to arrival at the destination, send a letter of interest, or a resume, and ask to set up a visit (also called an informational interview) with the organizations of choice. This can be done locally too, and may make finding someone on the inside to facilitate these discussions a bit easier. Ask for advice about a job function, field or target industry. Some of the best relationships are born out of these preliminary discussions, when there is no open position to discuss. Sure, it's important to unplug during the 10 days away, but putting just a little effort into job search activities during Spring break will also help to relieve the pressure that will build up when campus life resumes. Aspire! Empower! 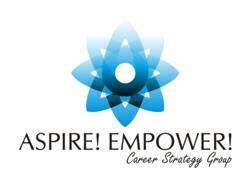 Career Strategy Group (http://www.aspire-empower.com) is a full-service career consulting firm that arms high-achieving professionals with empowering job search solutions enabling them to attract more job offers, at higher rates of pay, in a shorter period of time. Aspire! Empower! offers job search strategy coaching, résumé and career marketing document development (bios, Linkedin profiles, executive summaries) social media training, and career development workshops for individuals and companies, in the Washington D.C. area, and throughout the U.S.